A new clip from the PBS docuseries "American Epic." American Epic, White’s exploration of the music recordings of the 1920s and how they came to exist, features a trove of live performances, including this highlight of White and Nas dueting on the 1928 Memphis Jug Band gem ‘On the Road Again.” Other performers include Beck, Willie Nelson, The Avett Brothers and Taj Mahal. You can watch the series’ trailer here. Check out Jack White’s tour of Third Man Records for CBS This Morning here. As this new clip points out, the first electrical recording system was invented in 1925, and only a few were ever made. Today just one exists, and you can get a good look at it here. Alabama Shakes’ version of “Killer Diller” (which was originally recorded by Memphis Minnie in 1946) sounds appropriately homespun, with “no editing or enhancements” involved. The three-part American Epic premiered on PBS May 16, with the second and third installments set to broadcast on May 23 and May 30, respectively. 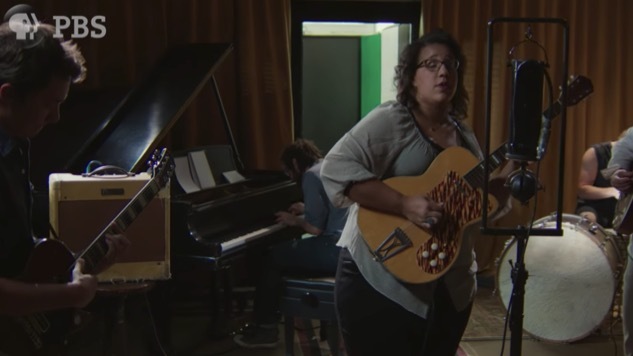 While you’re here, check out this exclusive Alabama Shakes performance from 2011, recorded at the Paste Magazine headquarters in Decatur, Ga.